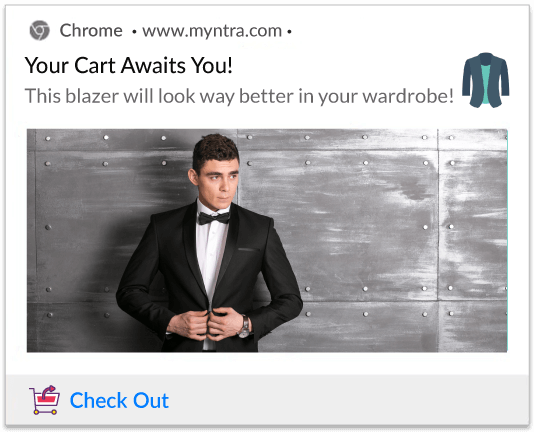 In E-commerce, there is no escaping cart abandonment. The average cart abandonment rate is as high as 69.23%! At desperate times like these, you need to look out for growth hacks to bring users back to the cart. Read on to know how Push Notifications act as a breath of fresh air amongst the clutter that users are entangled in. The trick is not seeing what is obvious, but identifying the actual problem and then solving it. During the World War II, the American Air Force lost many planes due to constant attack from enemy fighters. The plans that survived came back looking like a steel strainer, with all the bullet holes. Adding extra armor was out of question as it would ultimately make it difficult to maneuver. Another solution that was proposed was to add armor to the fuselage, where most of the bullets holes were spotted. But Abraham Wald saw what others didn't. He said the armor doesn’t go where the bullets holes are, but where the bullet holes aren’t. And boom! It all made sense! Everyone was so busy coming up with a solution that they lost sight of the core problem; the bullets that hit the engine of the plane never made it home! If the engine was secure, more plans would make it back. Exactly the same way, you get blindsided. You end up pushing all your dollars in bringing in new users to your site and take the ones who you have shown buying intent for granted. There are users in the conversion funnel, ready to convert, all with just a nudge and you might be out on a goose chase. Imagine even half of the users abandoning carts ( 69.23% ) converting. Now that’s home run. So, for every 100 users who add to cart, 70 abandon it. 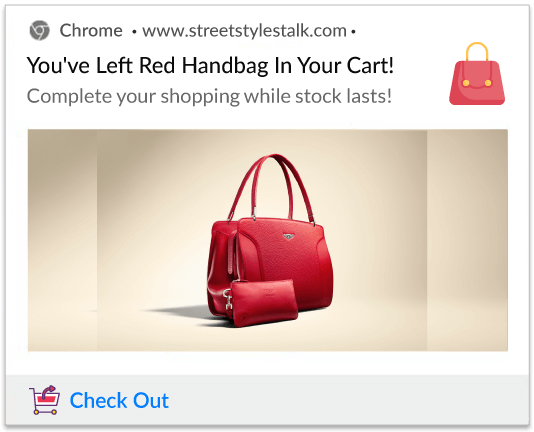 We have talked about why users abandon shopping cart at length earlier. 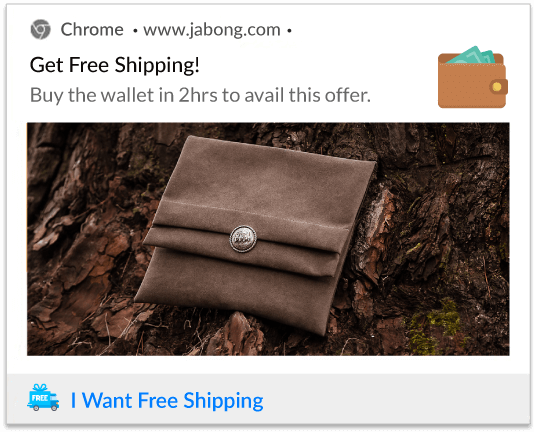 Web push notifications are extremely effective when it comes to engaging users, especially users who have shown buying intent. Not only do they contribute significantly as a direct conversion channel but also act as a conversion catalyst in the overall funnel. But manually sending personalized notifications to every single user is unimaginable right? To make sure that you don't have to break your head every single time a user abandons the cart, what you need to do is embrace automation and keep pre-crafted templates handy. Push notifications make it possible to get benefits such as acing the timing and makes it relavant to every user, which ensures an increase in click-through rates and revenue. 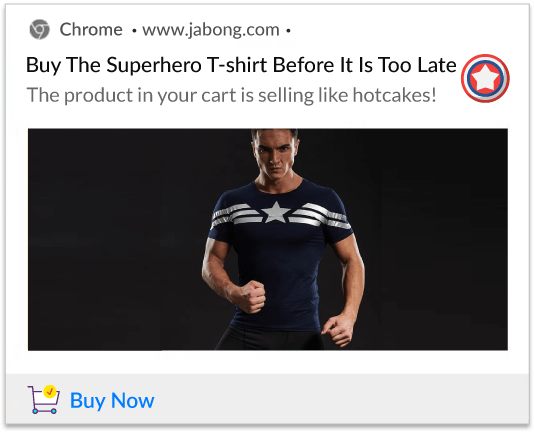 It targets users who have abandoned the cart with personalized notifications; which are crafted exclusively for every user. If you are a one-man army or a small team for that matter, you know how nerve-racking it can be when you need to do every single thing manually. Automation comes as a rescue so that you can allocate time for something more productive. With automation, you don't need to juggle many users at the same time and give them individual attention without actually giving any. All that you need to do is sit back and relax, while you bag sales in the background. With web push, you can send automated, personalized and triggered notifications to the right users at the right time. 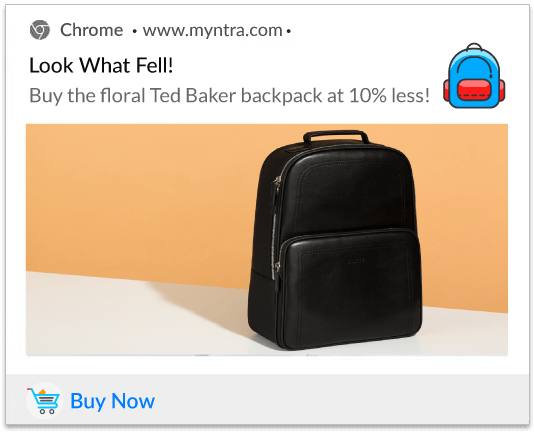 The ability to add the product name and the image of the exact product they abandoned, helps to grab the attention of the user and encourage them to convert. Automation is all fine, but what is the content that will be pushed? Figuring out what to write or what image to use can be tricky, moreover to write it every single time is cumbersome. To make your life easy, you need to have some templates handy. You can have a look at some welcome notifications templates here. 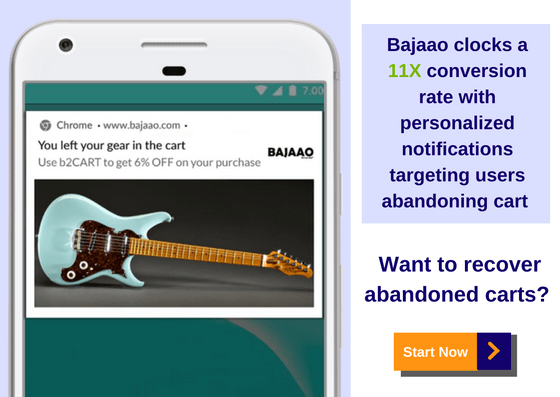 Bajaao, a Shopify Plus store follows that led to an increase of 93% in their conversion rate. Showing the users the exact product that they have abandoned increases their intent to buy. Images speak more than words, the right image can speak volumes. Images lure them into making a purchase. The more they see the product they have abandoned, the chances of them making a purchase are higher. Tell them that it would look great on them. Motivate them and encourage them to buy. Tell them that the product belongs to them. 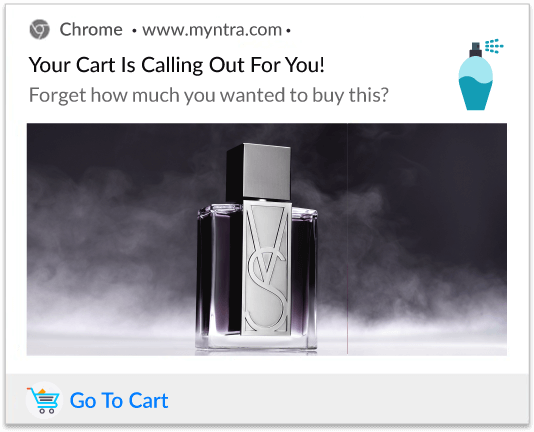 Tell them they deserve to have the product in their cart, influence them psychologically to click on the buy button. Tell them that you are saving the product in their cart so that it doesn't go out of stock when they want to but it. This makes them appreciate you and makes them convert quicker. Tell them that they need to be quick if they want to buy the product in their cart as it might go out of stock. Urgency creates wonders. The user fears that they might lose the product and quickly make a purchase. This is a boon for the price sensitive. It has been observed that the age group from 18 - 34 react well to discounts. 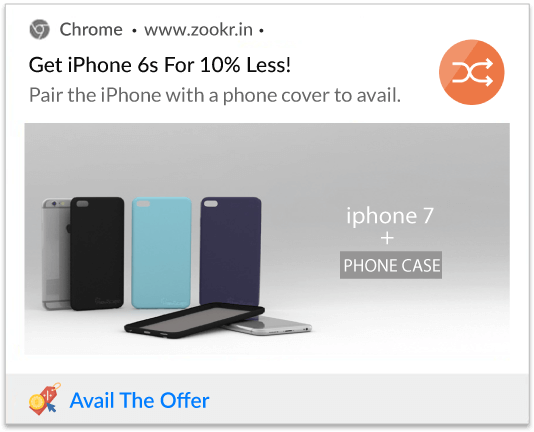 It encourages them to make a purchase for availing the offer. Make them happy by appreciating their choice. Tell them that not everyone has an eye for awesomeness. Create an image in their heads on how they would look with the product in hand. Remind them about the product in their cart. Sometimes it so happens that users forget they liked a product to the cart and had plans to buy it later. 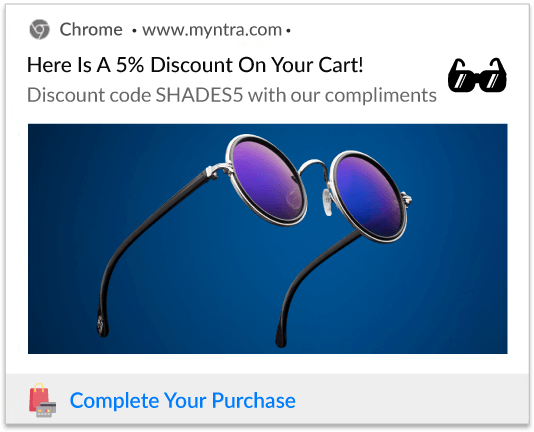 This reminders awakens their purchase intent and makes them buy the product. Surprise them! Make them curious with a catchy headline. Slide in a little discount if you have to and make them re-visit your website and convert. Shipping cost still remains one of the major obstacles for users to convert. So why not eliminate them altogether to make users convert? Tell them about the free delivery option you are providing. Add a layer of urgency to it to make it work like a charm. Make them realize that if they don't buy the product in the cart, they might lose it forever. Show them what they might miss out on. 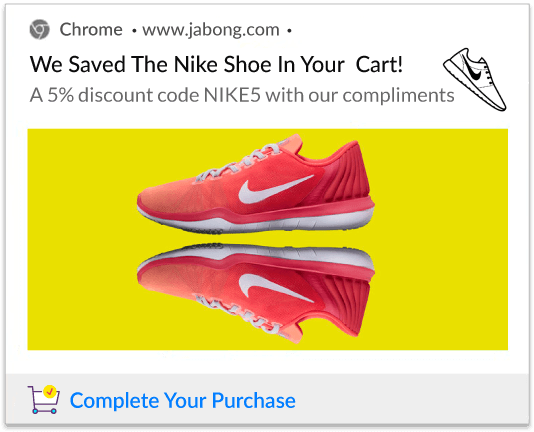 Tempt users to make a purchase complimenting the product in their cart with another product. Show them how beneficial it can be as they can get 2 product at a discounted price if bought together. Here the users can get a discount by inviting their friends to shop. Offers like this work both ways. They get to avail the offer and you get a new customer. Note - Not every push notification needs to have an image. 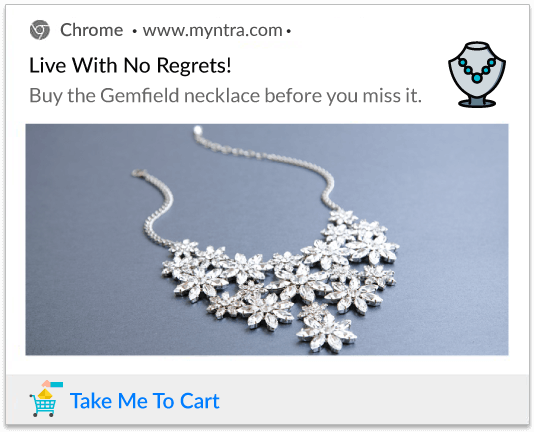 These handy abandoned cart push notification templates will help you to bring in variations to your notifications. 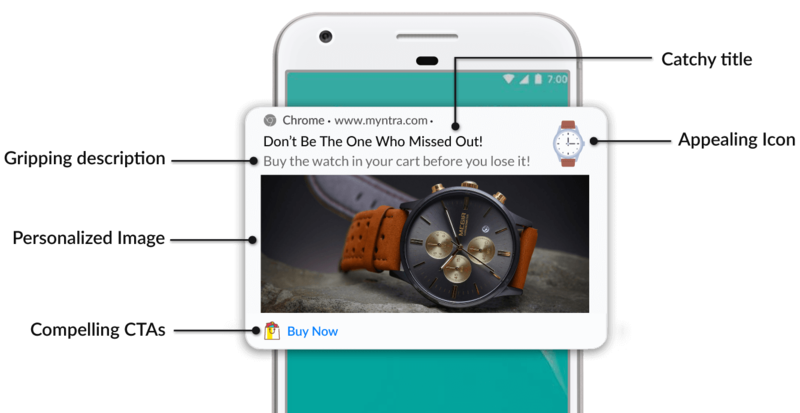 Know all about e-commerce retargeting using web push notifications in this guide. Just ping us on chat, if you want to discuss more templates specific to your store.